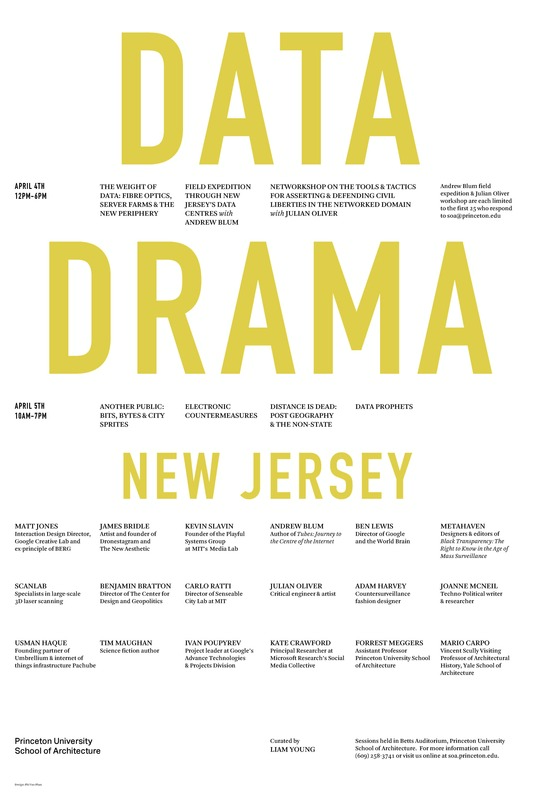 On April 4 +5 Liam Young will be hosting Data Drama: Crunching, Chunking and other Novel Data Technologies to Better Help us Escape From the Present at Princeton University School of Architecture. Across 2 days 20 speakers will be discussing the spatial possibilities and consequences of big data and the network. To accompany the presentations Andrew Blum, author of Tubes: A Journey to the Centre of the Internet, will be coordinating a field trip through the wilds of New Jersey to visit a series of local data centres and critical engineer Julian Oliver will be running a workshop on the tools and tactics for asserting and defending civil liberties in the networked domain. For details head over here where the event will also be live streamed. Use #datadrama to contribute to the conversation.